Whenever I go to Hong Kong, I will never fail to go to Tim Ho wan for my dim sum fix. They have to my opinion the best Cha Siew Polo bun and Ma Lai Go. I cannot comment on the Singapore branches as I have never been there. So, I have done some research and the traditional Ma Lai Go has to be fermented for at least 2 to 3 days. Tim Ho Wan ferment theirs for two whole days. Although the cake is brown in colour, it has no brown sugar in its ingredients, just normal sugar. When you ferment the batter, it will turn brown while steaming. I find it interesting, although a little yeast was used, there are no taste of the yeast at all in the steamed cake. It is fluffy, soft and spongy at the same time. I like the result of the cake with the streaky holes! It is like the 'Pak Tong Go' I used to eat when I was a child. You need patience to make this cake if you want it this way because of the fermentation. I figure you can steam the cake on the same day with just a little waiting but I suppose it will have a different effect. Well, more experiments on the way! My good friend found this recipe in her written book of recipes from some newspaper cuttings and jotted it down. 1. First, start the fermentation process by mixing all the ingredients for the starter in a bowl and cover with cling wrap and put it aside. 2. Let it ferment for at least 12 hours without touching it. Mine was fermented for 36 hours. The longer you ferment, the darker will be the colour. The texture and the colour will also depend on how long you ferment it. 3. When you are ready to prepare your cake, sift bread flour, custard powder and milk powder together in a bowl. 4. Place the fermented starter in your mixing bowl and mix it with a beater attachment at low speed. 5. Gradually add the sugar and beat it for a couple of minutes. 6. Now, add in the flour mixture gradually, still at low speed for another couple of minutes until combined. 7. At this moment, change to the whisk attachment in your mixer and add the eggs one at a time at low speed. 8. Turn the speed on medium high and whisk it for 10 minutes more. 9. Scrape down the sides of the bowl half way. Now you will notice that the batter will turn smooth without lumps. 10. At low speed, add in the melted butter and the oil. Mix well. 11. At this juncture, you can either put the batter in a bowl and ferment again in the fridge for 12 hours (I fermented mine for 24 hours) or you can proceed to add on the last of the ingredients and steam it. 12. You can also just ferment it for 2 hours and proceed with the rest of the ingredients. this depends on how impatient you are. 13. When you are ready to steam the cake, or rather fermentation is up, prepare the steamer with a cover and make sure there is enough boiling water. 14. For the pan, I used an 8 inch cake ring and a steaming rack and put baking paper in the cake ring with a single big piece of paper with an overhang for ease of removing the cake later. 15. If you have an 8 inch bamboo steamer, it is all the better and ideal. 16. 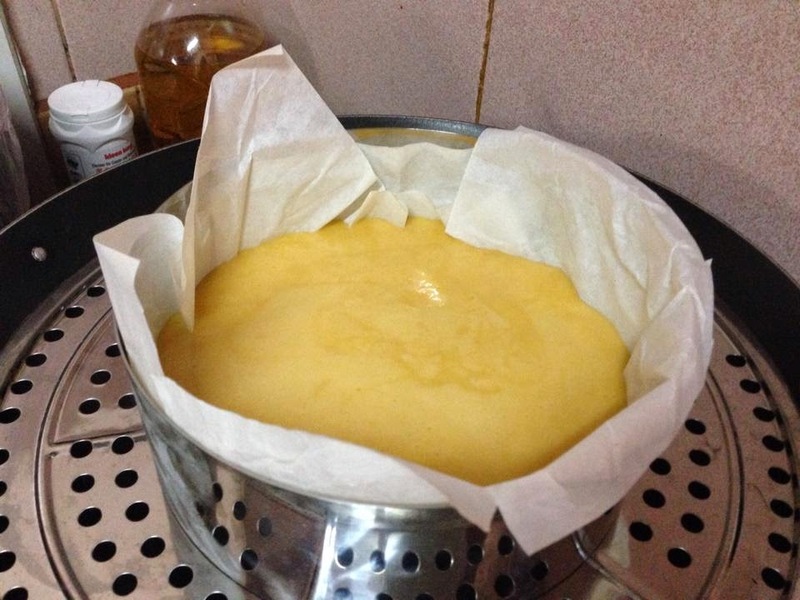 I suppose you can use a normal round cake pan to steam as well, just make sure you line the pan with a whole piece of baking paper as well for lifting the cake up. 17. Now, add in the alkaline water (lye water) if using. 18. Sift in the baking powder and bicarbonate of soda and mix until just combined. 19. Pour the batter into whichever prepared container you are using to steam the cake, cover and steam at high heat for 45 minutes. 20. Do not be tempted to open the cover for the first 30 minutes. 21. After 30 minutes, you can check whether there is enough water in the steamer. Replenish with hot water to continue steaming if necessary. 22. Let the cake cool on a rack for at least 5 to 10 minutes before removing it from the pan. Eat it fresh and warm. Store the rest in the fridge and you can heat it in the microwave for 10 seconds whenever you need a piece! I've just tried to make the starter dough but found that it's too dry!I've add more water to make it more watery!I'm still waiting for the results. This recipe works wonderfully for me with a little adaptation of my own. The recipe is posted in my blog at The Informal Chef. Thanks. Picture Window theme. Theme images by linearcurves. Powered by Blogger.